Heat oven to 400°F. Spray or grease 15x10x1-inch pan (use dark pan for thin crust). Unroll dough in pan. Starting at center, press out dough to edge of pan. Meanwhile, cook spinach as directed on box. Drain well; squeeze to remove liquid. In 6-inch skillet, heat oil over medium-high heat until hot. Add onion; cook and stir 3 to 4 minutes, stirring frequently, until tender. 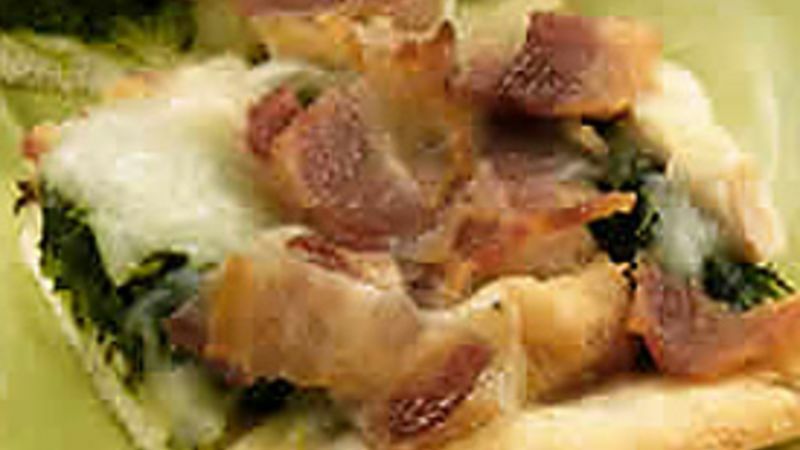 Top dough with spinach, onion, chicken, cheese and bacon. Bake classic crust 18 to 20 minutes, thin crust 14 to 18 minutes, or until cheese is melted. Cut into 6 rows by 4 rows. Tip if using classic crust: For a crispier crust, prebake crust 9 to 13 minutes or until edges are light golden brown, then add toppings; bake pizza 9 to 12 minutes.